Location: Room #120, C.K. Choi Building, 1855 West Mall, Vancouver, B.C. One of the more curious incidents in the making of modern India occurred on the eve of Independence when a group of seventy-two women entered New Delhi’s Constituent Assembly and unfurled the newly chosen national flag. In a last minute change decided only three weeks prior, the Gandhian charkha or spinning wheel, was replaced by the Buddhist chakra, or dharma wheel, as the flag’s central symbol. On the surface, the choice may seem perplexing considering that Indian Buddhism was said to have become ‘extinct’ nearly eight hundred years before and less than one percent of India’s population identified as Buddhist at the time. Yet demographic statistics are not always reliable indicators of cultural conscience. From the circulation of Buddhist relics in distant lands to the reinvention of Buddhist symbols in contemporary state regalia, the Indian government sponsored a wide variety of Buddhist heritage programmes in the name of world peace, Pan-Asian unity, secularism and enlightened democratic values. 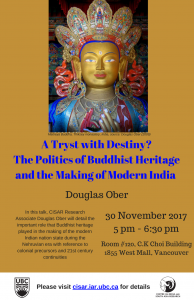 In this talk, I will detail the important role that Buddhist heritage has played in the making of the modern Indian nation state from the time of the colonial Viceroys up through the current government led by Prime Minister Narendra Modi. Special attention will be paid to the early years of Independence and the enduring legacy of Buddhist diplomacy left by the country’s first Prime Minister, Jawaharlal Nehru.